Seaside is famous for its role in the 1998 film, The Truman Show. With just a glance you can envision Jim Carey strolling down the streets in an endless quest for the outside world. But the glory of Seaside’s town square is in the details. Masterly crafted artistic archways, pristine gardens and original artwork fold into the natural surroundings. With plenty of quaint spots to eat, drink and relax, Seaside Town Square is a worthy day trip. Of all odd things that caught our attention, the doors on some of the buildings were just beautiful. Reminiscent of cobblestone paths in rural Italy with lazy gardens and antique laterns, be sure to pay attention to the entrances of the stores. Lost in the whimsical limbs of the trees that adorn the paths you will find metal sculptures worthy of Manhattan. 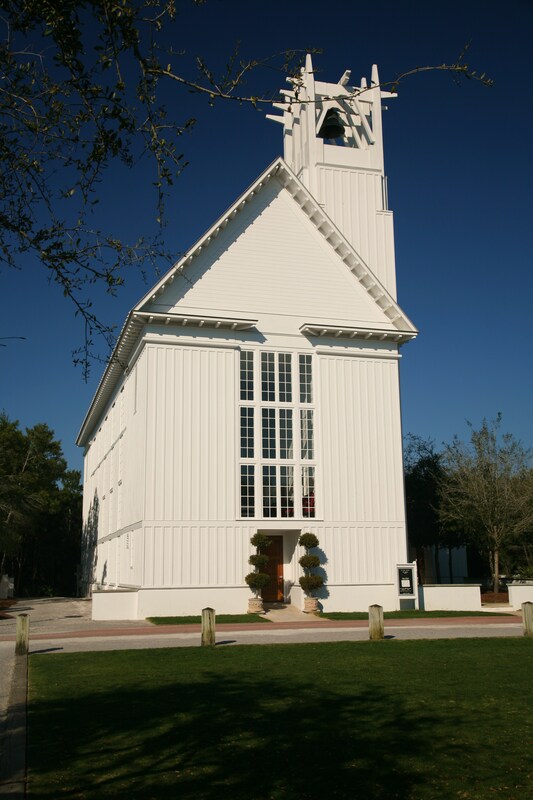 The Seaside Chapel is just breathtaking and a popular spot for South Walton Weddings, though you will need a healthy budget to afford this spot for your special day. Deeper into Seaside you will find plenty of activities for the whole family, including kayaking or canoeing on the lake. Be sure to grab a burger at Pickle’s Beachside Bar & Grill or sit down to a delictable treat at the popular Bud & Alleys.